It used to be the common belief that one had to have their wisdom teeth removed somewhere between the age of 18-22. Today that’s no longer the case as more and more evidence has shown the risk of complications should make practitioners take pause before arbitrarily removing wisdom teeth. The teeth are impacted and damaging the tooth they are impacted against and/or possibly pushing teeth together causing crowding. 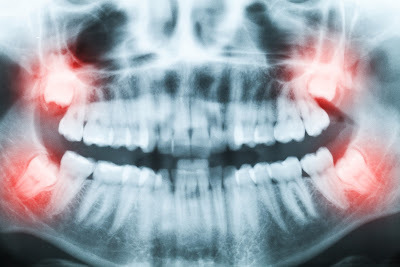 Erupting wisdom teeth don’t always come in straight, they can grow at various angles and sometimes even horizontally either completely covered by the gums or partially covered. These impactions can sometimes undo the effects of braces, bridges, crowns, partial dentures and other types of dental work. If a wisdom tooth partially emerges through the gums a passageway is created that harbours the bacteria that cause gum disease and oral infections. For some people it’s possible to extract wisdom teeth using just local anaesthesia which numbs the teeth so no pain is felt during extraction but pressure will be felt. If the tooth is infected, close to a nerve or the patient is really nervous then an alternate possibility is to see an oral surgeon so the teeth can be extracted under IV sedation. In rare circumstances it also becomes a possibility that you may need to have your wisdom teeth removed under general anaesthesia but this has become less and less prevalent over time. Hopefully when you have your wisdom teeth out there are no complications but that really depends on your health and your potential risk factors. One of the most common complications that can arise from having your wisdom teeth taken out is dry socket which is caused by a blood clot not forming in the extraction site. This quite often can be extremely painful and while there is no defining characteristic that will automatically lead to a dry socket your risk can be increased by smoking, diabetes or a previous occurrence of dry socket. It’s best to see your dentist on a regular basis so he can follow your care and best suggest the course of action regarding removing or keeping your wisdom teeth.